Regretfully, I couldn’t go outside until the day’s light waned and I missed nature’s sparkling festival of diamonds. This was the best I could capture as the sun dropped into the pines. Today is another bright sunny day. This entry was posted in Minimalist and tagged beauty in nature, Julie Footer, sparkling diamonds, winter wonderland. Bookmark the permalink. Do you actually have accumulation already? 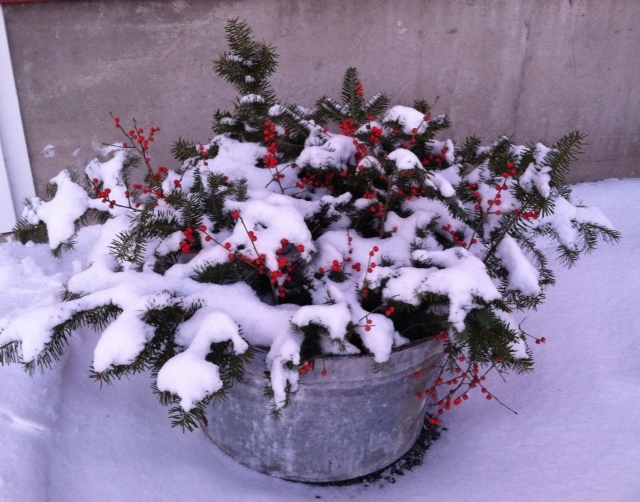 Red berries always stand out so brightly against the snow. Bucket of Boughs. There’s a song in there. Yes, we have accumulation! It’s only about 2 inches of it, but it’s beautiful.